In a small saucepan, combine 1 cup water, 2 Tbsp sugar and 4 Tbsp rum. Bring to a simmer for a minute and stir until the sugar dissolves then remove from heat and let cool to room temp. If using whole almonds: combine 1/2 cup sugar, 2/3 cup almonds and 1/8 tsp salt in the bowl of a food processor, and pulse until finely ground. Add the butter, and mix again until well blended. Add in the eggs one by one, and process on high speed until creamy and fluffy. If using almond meal or almond flour: In the bowl of a stand mixer fitted with the whisk attachment, combine 1/2 cup sugar, 1 cup almond meal and 1/8 tsp salt. Mix until well incorporated, then blend in the butter. Finally add the eggs 1 at a time and mix on med/high speed until the whole mixture is creamy and fluffy with a frosting-like consistency. Preheat the oven to 350° F . Line a cookie sheet with parchment paper. After your croissants have been on the counter drying out overnight, and you're ready to use them, slice each croissant horizontally like you would for a sandwich. Work with each croissant one by one: dip it into the syrup, coating both sides and the ends well. The croissant should be quite moist, but not soaking wet. Just dip it once on each side. Arrange the croissants on a baking dish, cut side up. 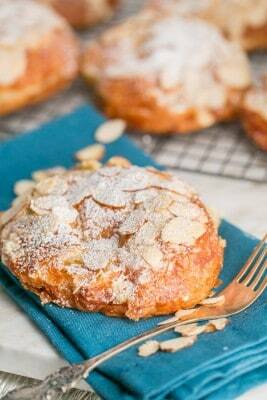 Spread about 2 Tbsp of almond filling on the bottom half of each croissant. Place the top halves on and spread about 1 Tbsp of almond filling over the top. Sprinkle with sliced almonds. Bake on the center rack for 15 to 18 minutes,or until the cream is golden. Transfer to a wire rack and cool to room temperature or just warm. Dust with powdered sugar before serving. These are best served the same day they are made.